Martin Smith’s Cobblers career began in the Spanish sunshine and ended at a similarly sun-soaked Sixfields, with three very good years and a promotion in the bag. Northampton manager Martin Wilkinson had campaigned hard for the signature of Smith, hot property after leaving Huddersfield, and was so keen to get his man he not only boarded an airplane to speak to him but also had no time to make any wardrobe-related considerations. “I was in Marbella at the time and I went over to Malaga airport to meet him,” said Smith. “I remember he turned up in a massive overcoat even though it was 29 degrees. He was a lovely fellow, he had all the plans for the stadium development with him and it was great that he flew out there to speak to me. Despite being flattered, heading to Northampton was not something that had been on the radar of a player whose first club was Sunderland, where the supporters nicknamed him ‘Son of Pele’. 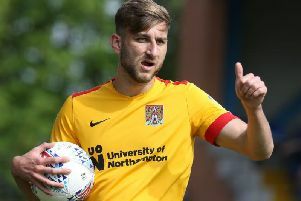 Smith agreed a three-year contract but did not travel with the squad for their pre-season camp in the United States due to a reluctance to fly long-distance, instead staying at Sixfields with Chris Hargreaves. His working relationship with Wilkinson was brief, spanning just a handful of games before a hamstring injury in a game against Macclesfield put him on the treatment table. By the time he returned, the manager had been sacked after the team’s results had not matched his financial outlay. “I don’t think he wanted to be in that position,” recalls Smith. Enter Colin Calderwood. Town snapped up the Scotsman, himself a highly-rated coach at Tottenham, and paired him with the worldly-wise John Deehan to form a Sixfields double act and immediately transform the landscape at the club for the players. “I loved working with him,” said Smith. “I had worked with John Deehan at Huddersfield and it was a lot better straight away, a lot more professional. Success was almost instant for Calderwood at the Cobblers – he arrived in October and took the team to a play-off semi-final with Mansfield which was so dramatic that it remains embossed in Smith’s memory some 11 years later. “If Phil Crossley had got his decisions right that night it could all have been so different,” he said. “And it shows you how bad it was that I can still remember the ref’s name now. “Even though we were 2-0 down from the first leg we had a belief in our dressing room that we’d win that night and get to the final. Of course, it was not to be, with Mansfield pulling back a vital goal to end the tie 3-1 and then win a penalty shoot-out and grab the place at Wembley for themselves. The episode remains a bitter one for the supporters and is very much a case of what might have been for the players involved too. “I think by the time we actually did get promoted (in 2006), the chairman was sick of funding everything but if we’d gone up in 2004, we’d have got the much bigger gates and who knows what might have happened. Town were play-off regulars during that period and the following season had a two-leg crack at promotion with games against a very good Southend United side. The Blues prevailed thanks to a Freddy Eastwood penalty in the second game at Roots Hall, and again Smith was not in peak condition. “I actually had a torn calf muscle and it was heavily strapped up just so I could get through the game,” he said. When promotion did finally come, it was with Smith in the midst of another injury, although it did nothing to harm his form. “I think those seven games at the end of that season was the best run of games in my career,” he said. “I couldn’t really enjoy it because I had a bulging disc in my back which ran right down my hamstring so I was only playing at about 70 per cent but the way I was performing I thought I’d still be able to do a job at 50. “One of the best games of my life was the 1-0 win at Peterborough. That summer, Calderwood was much in demand, with Ipswich Town the first club to request a discussion about his services. With rumours growing, and Smith’s own contract ending, the player asked him directly if he was leaving, to which he replied ‘probably’. “When he told me he was going that made my decision for me really,” said Smith. “And I wanted to go back to the north-east so I signed for Darlington. “I probably could have stayed at Northampton for another year or two and John (Gorman) wanted to keep me, he fought quite hard to get me to stay. Martin Smith will play in the Leon Barwell Trophy fundraiser match at Sixfields, on Sunday April 12 (3pm ko), for which all proceeds go to the Leon Barwell Foundation. Tickets are available from the Cobblers and Saints box offices.